YOU , have the opportunity to visualize, design and celebrate with gusto the panorama of life. Viewing the big picture and cutting through “stuff” that drains you of energy and happiness, YOU are limited only by your attitude to achieve the altitude you so want and desire. Each day, each month, each year, we have many choices. Our design in life may be out of balance at times, but overall we have the ability and power to structure our lives for a grander picture of happiness, growth and success. Coaching facilitates the process. As your Coach, I will support, encourage, and help you to move faster towards that vision. It is energizing to design a perfect day! Are you skeptical, interested or intrigued? Excellent! The vision is yours to behold. SELF , evolves through the years. Often, it is a reflection of our many experiences. Here lie our beliefs, values, feelings, opinions, frameworks, and boundaries. It is that inner voice of integrity; perhaps, the sum total of our being, our thoughts and persona. Because it is so personal, it influences our actions daily. If a core belief is questioned or we are asked to operate in opposition to a value we cherish, we stall. Thus when we design supportive environments to move us forward, the environments of our self must be part of our overall vision. Principles to deal with frustrations surrounding self are easily learned and can be applied. This is comforting and releases new energy. The result is we clear the path for greater growth and personal success. HEALTH , the environment of HEALTH covers our physical and mental well being. Ideally, our relationship to our body should be like a good marriage, but oh, the abuse! Excuses are prevalent. There isn’t time to exercise or cook the right meals. Unfortunately, not reducing your stress or having poor health habits hurts the person you depend on the most-you! Setting up supportive environments around health needs is incredibly rewarding for you feel the difference in an increased sense of well being. When the body is treated with respect thereby, creating more stamina and energy, you gain strength to accomplish more of what you want to do. INFORMATION , twenty-first century, INFORMATION is everywhere. The proliferation of and access to the many ideas, concepts, technology, E-Network and schools gives us the opportunity to grow expediently. Still there is such an overload that are minds get muddled with all the choices. With so much information, it is helpful to build environments that support our growth in all the changes. Think of the last ten years! Who uses a typewriter today? The computer has revolutionized our lives along with fax machines, cell phones and a myriad of other technological choices. Knowing where to go and how best to access the information is part of the challenge. Often it means accepting a learning curve that at times is frustrating and disconcerting. What a great time to use a coach to ease the transition! SYSTEMS , we operate within many SYSTEMS at home, in the work place and at our daily routine. How efficiently we handle tasks may be a function of what systems are in place. Good time management, a well-organized desk, and functional filing systems are but three examples, which, if designed well, make our lives run smoother. Even a small system change can produce success in a matter of moments. A coach helps to identify, design and install systems that work. The byproduct of well-designed systems is balance. 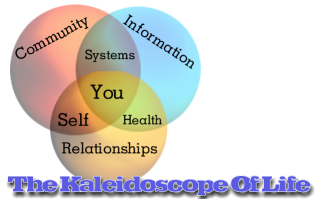 Just as the kaleidoscope’s image is symmetrical, so is our life when good systems are in place. RELATIONSHIPS , we have many RELATIONSHIPS: family, friends, significant others, coworkers, employers, customers, contacts, etc. Most of our relationships are positive and uplifting or we wouldn’t have them, but some may be discouraging and draining. A negative encounter with another person can quickly ruin a good day. Coaches want to maximize the good, minimize the bad and help you identify ways to recognize those relationships that support your life. Sometimes we can’t eliminate the negative one, but we can structure our situation to not allow them to deplete our precious energy. COMMUNITY, our COMMUNITY keeps us grounded in more ways than one. This is where we connect with nature, situations, events, activities and opportunities to evolve. Although we can survive alone, most people want to be active and involved in their community. How we use our talents is a reflection of our sense of being. When looking at the environment of community, we strive to feel uplifted, broadened and connected. Designing this environment to expand our lives to pull us forward is rewarding unless we become over committed. A coach can help by seeking clarity of priorities, so you can experience the best of what your community has to offer.